writing things down gives them an importance: whether it's in the notes on your phone, a draft in your email, or tweeted/posted/blogged publicly. i didn't used to believe that simply writing something down gave it power. now i find it hard to believe how much power. 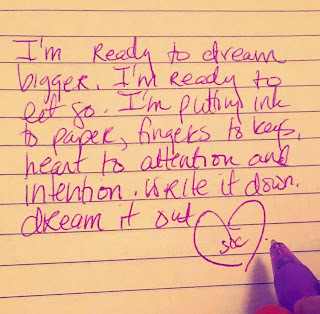 last year i was doing some life coaching with elena and she had us make a list of dreams for the year. i skeptically made a list, including things on the list that i didn't even think were really possible. among the items that i had been told were impossible or had no reason to expect that would happen: 1) receive ARC funding (check), 2) become an associate professor (check). at the end of the year, when i found that list in my phone, i almost freaked out. i hadn't even applied for the CUNY job when i made that list--i had no reason to believe that i would be able to get to where i am now at that point. sure, i had a hand in those things happening. but writing them down gave them a place in my mind, a sense of priority. the same thing can happen in reverse. do you know what else i write down every day? how many calories i've eaten and how much i've worked out. this is one of those pieces of an eating disorder that i've termed "ok" for my life. it isn't actively hurting me, so why not? because i'm giving it power. i don't even ever look back over my past days. it just gives me some sort of comfort knowing i have it in a list. but it's also embarrassing: when i update the list, i'm terrified that someone will look over my shoulder and see what i'm typing. i envision my friend next to me asking "why are you writing down '45 mins run' in your phone?" my secret answer: "um, because i'm afraid that it doesn't count if i don't write it in this list right this second." hmm. clearly that doesn't make sense. i've been writing down my exercise and food intake since i was little. my parents paid my sister and i to do so when we were young--it was about making sure we were getting our fruits and vegetables and dairy per day, etc. i don't think this version was bad parenting, but i've been doing variations of this for 22 years now, and sometimes with dangerous levels of obsession. there were points when i weighed food and wrote down exactly how many calories, protein, and fat in each serving of each thing i had that day. i carried a notebook with me everywhere. now i "just" make notes of exercise and a running tally of calories for the day. some of my closest friends know about this, but i've delayed writing about it because i was afraid of what anyone might say about the initial food diary keeping my parents encouraged. but let me say this in their defense: my sister never even completed hers when she was getting paid for it. me, on the other hand? i chose this behavior as a safety net. i chose to take it into adulthood. so why am i writing about it now? because i'm tired of it. i'm ready to let go a little more. and i had some motivation yesterday: i received this message via facebook from amy. Hi spring! Not sure if you'd remember me...but I was also and instructor at Penn state! I graduated in '08. I was also a BBH major! Anyways I recently completed a 200 hour yoga teacher training....amazing!! So I have been reflecting back on all the inspiring teachers I've had along the way and you're one of them!! I always loved your classes at PSU...they offered a little something more than just fitness. And you were also a great female role model to look up to as I was just an ungrad and you were working your PhD! You totally emulated girl power!! I enjoy reading your blogs because it's always on a theme that anyone can resonant with! It just shows that by being a bit vulnerable and opening yourself up you really can connect on a deeper level! Anyways I just wanted to share this with you because as I look forward to a new blog post I realized that you probably don't know how influential you are! So thank you Spring for being such a great teacher! there are some days when writing things down makes more of a difference than we know. did amy know that message would hit me today? that it would inspire me right back? probably not. but that's what happened. (amy, that was one of the most beautiful messages i've ever received; thank you.) and i'm going to place attention a little more thoughtfully: 1) i'm making a new dreams-for-the-year list, and 2) i'm no longer going to write down my exercise activity. 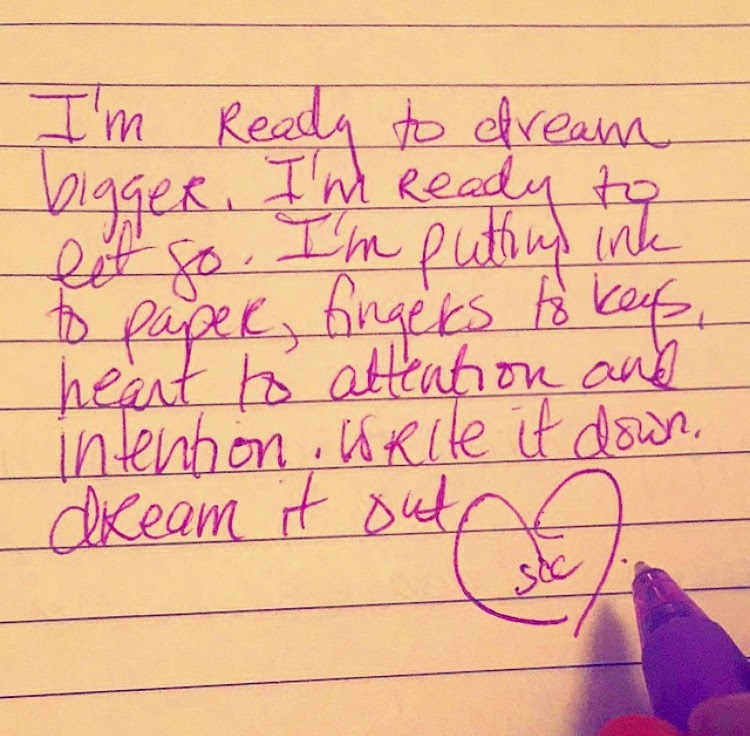 i want the dreams to have power; i don't want the disordered eating behaviors to have power. when i was unpacking the things that arrived from sydney last week (FINALLY!!! ), i found a notebook of exercise notes from 2008. yeah, i still had it; i always saved them. as evidence. guess where the notebook is now? in the garbage.